I think TLT is in breakout mode now that it is firmly above the $122 recent high. I am being cautious though and taking half of my position off the table here for over 130% in profit or about $14,000 on just this half of the trade…and I still have another $14,000 profit waiting if I decide to take it! Really nice to see it play out like this. I was actually worried this wouldn’t work out after seeing the choppy price action a few days after I started the trade. Let’s walk through how this trade happened from the start. 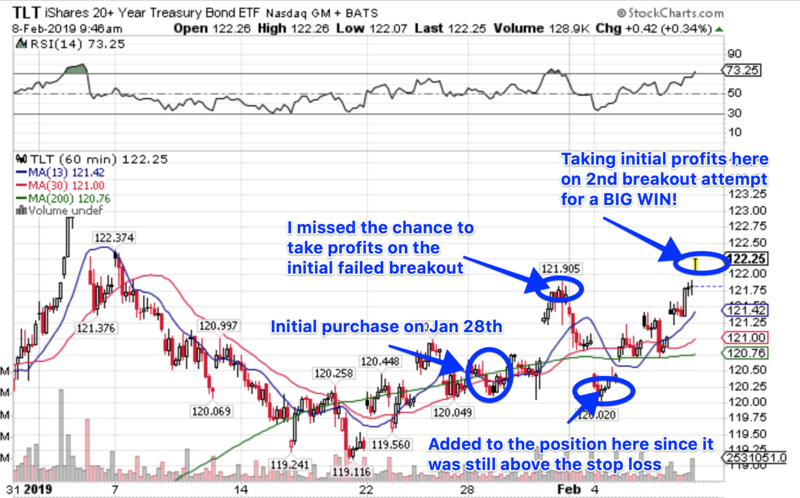 Here is the chart I sent you in the initial email on Jan 28th, when I started the trade. You can see my clear stop loss area and profit target range. 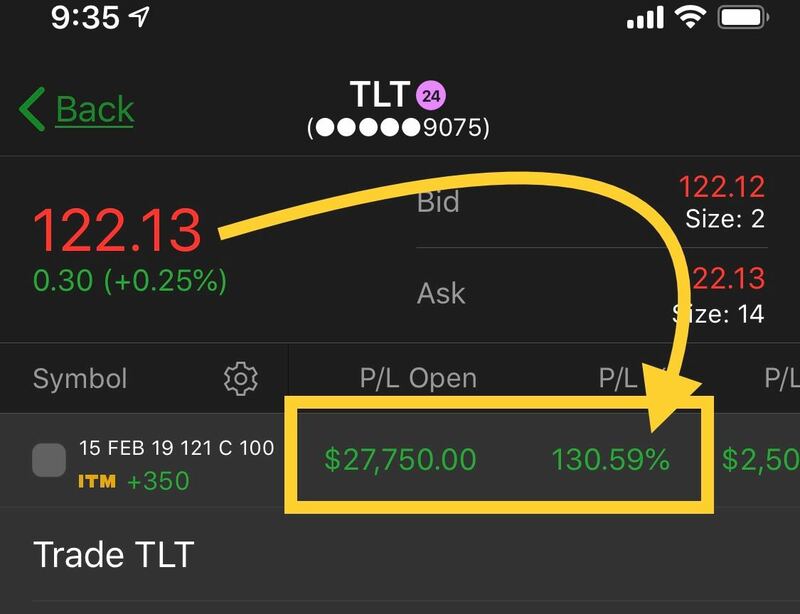 As you can see, within just a few days after I started the trade, TLT shot up nearly to my first profit target, and I was up a quick $13,000. I was stubborn and wanted it to “hit” the $122 target, but instead, it came within $.10 of that and then quickly retreated. I went from a $13,000 profit to a $5000 loss in just 2 days. I sure was upset about that, but since the price was still above the stop loss zone, I used that weakness to add more contracts and lower my average price. 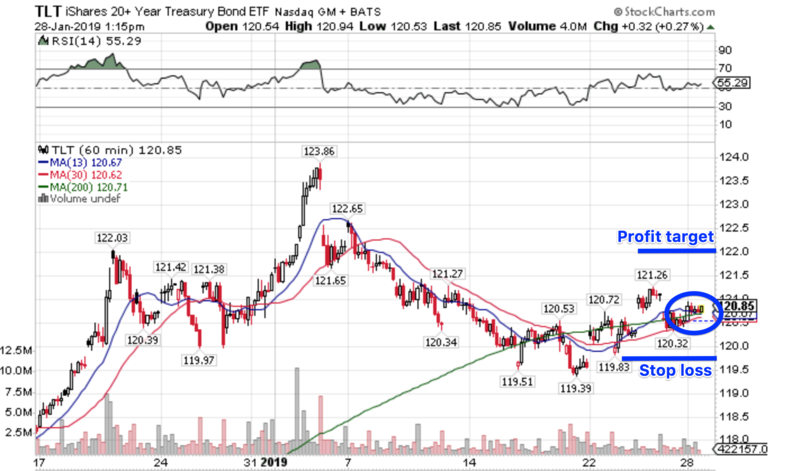 Sure enough, that dip was another fakeout and TLT has been climbing since then. Today, it broke past the $122 level again, and I am NOT missing the opportunity to take profits this time. I’m putting $14,000 in my pocket today (as you can see on the actual screenshot from my account, below) on this and letting the rest of this trade ride higher. Hopefully, I’ll see this north of $123 before it expires and I will lock in an even bigger profit on it! I think this is a good lesson on how to stick to a gameplan once you set it up and not give up on a trade because it didn’t do exactly what you wanted it to do. In hindsight, the only thing I would have done differently here is to take the initial profit when I had it. That was just stubbornness on my side, and we can’t let that happen as traders. We need to take what the market gives us. Don’t forget about my free ebook. Sign up for that here!